Fri - Sat - Sun 11 a.m. to 6 p.m.
Conveniently located on the Las Vegas Strip, the NoMad Hotel brings sophistication and excitement to the Park MGM. NoMad’s newest addition includes a highly anticipated pool party event that will be available to the public every Friday, Saturday, and Sunday while the weather is nice. 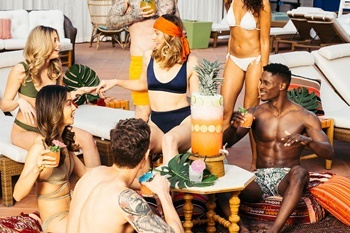 Known as Jemaa, or the NoMad Pool Party, Vegas’ newest pool party hangout is expected to become the go-to summer destination for party-goers over age 21. Jemaa Las Vegas officially launches on April 12 th and the pool will be open each weekend from 11 AM to 6 PM. The NoMad Hotel is a hotel within the Park MGM, consisting of the top four floors of the venue. On the third-floor roof deck of the hotel you’ll discover Jemaa. The beautiful pool party environment with plush furnishings and striking blue accents offers guests the perfect way to unwind after a long week of work duties and other obligations. Whether you want to go to drink, dance, socialize, or simply soak up the sun with a few friends, you won’t be disappointed with the offerings at Jemaa. The tranquil pool environment brings new services to the table not available at many other pool party spots, including a menu of unique options created by Chef Daniel Humm and restaurateur Will Guidara. The Poolside Café is where you can find your favorite poolside snacks, frozen drinks, hand-crafted cocktails, and a large selection of wines. Enjoy delicious options such as lobster rolls, fava bean hummus, or truffle chicken club. Wash it all down with a frozen beverage that will help keep you cool even when the temperature reaches three digits. If you prefer to enjoy your menu items in privacy, consider renting a cabana for your group. You can even have a cocktail fountain delivered directly to your location. NoMad Pool was designed by Jacques Garcia who was inspired by the Majorelle Gardens of Morocco to create the laidback and lavish pool environment. This upcoming pool party season, you can expect numerous events and a lineup of some of the biggest DJs and entertainers in the business, such as Mark Ronson, Mayer Hawthorne, and DJ Five. In addition to incredible table-side service, NoMad is well-known for offering great customer service, nuanced music, and a fun party atmosphere. It’s no secret that Jemaa will be where thousands of party-goers flock this year to enjoy an adults-only paradise. If you plan on visiting Jemaa at NoMad Hotel, here are a few things you should know. First, if you are a local, you’re in luck. If you show up to Jemaa before noon and present your Nevada ID, you can get in without a cover charge. You can also gain complimentary entry into the pool party if you are staying at the NoMad hotel. Next, be sure to keep up to date on current happenings at NoMad. The hotel is continually hosting events that you’ll no doubt want to be a part of, such as the upcoming Under the Stars at The NoMad Pool event which is expected to draw in tons of party-goers. With hospitality venues in New York and Los Angeles, the creators of Jemaa are no amateurs to the pool party game. No expense has been spared when creating the new pool party concept and you can expect it to deliver everything you want in a dayclub and more. Jemaa is a great choice for girl’s night out, guy’s night out, bachelor parties, bachelorette parties, birthday parties, and any other type of celebration you may be hosting. Call ahead of time to make reservations or visit Jemaa any time starting April 12 th .